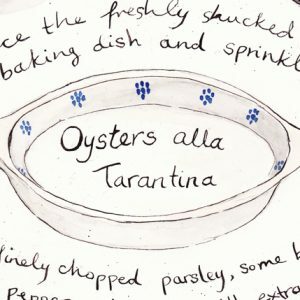 “Cookbooks aren’t read in a linear fashion,” my editor explained when we decided to cut up my lengthy introduction to Florentine and place bits and pieces strategically throughout the book instead. I knew it was true. I, too, with very few exceptions (Alice B. Toklas’ cookbook and Rachel Roddy’s Five Quarters for example), love flipping randomly through cookbooks rather than reading them cover to cover. Especially when they are enormous, I feel it’s the only way to really get through them. One of the biggest, doorstops of a book I own is The Italian Academy of Cuisine’s bible of regional Italian cuisine called simply La Cucina (it’s original Italian title is La Cucina del Bel Paese). 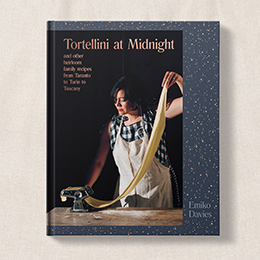 When looking for some inspiration, it’s a book I like to pull down off the shelf because you can search its pages by region, ingredient or by course (antipasto, soup, meat, fish, etc). Or you can just open casually and drag a finger down the page and let fate decide for you. Whichever way, something interesting and appetizing usually appears. And so it was the way I came across these delicious gnocchi from Piemonte’s most northern point, the Ossola Valley, sandwiched between Switzerland and the Italian Alps. The autumnal combination of pumpkin and fresh chestnuts adds colour and sweetness to otherwise regular potato gnocchi (you can also make this with chestnut flour instead of fresh chestnuts, which retains that distinct chestnut flavour while cutting down on the preparation time). An essentially rustic country dish, it is said to date back to the sixteenth century when these gnocchi were prepared with typical ingredients available in the mountains of the Ossola Valley. Tossed through a simple brown butter and sage sauce, they are divine and make a rather special and hearty meal but you most often see these served with a creamy mushroom sauce made with sliced mushrooms cooked in butter, garlic and cream. Cook pumpkin, potatoes and chestnuts separately. Remove the skin and seeds of the pumpkin and roast or boil until very tender. Drain (if you have boiled it) and puree, mash or pass through a food mill. For the potatoes, leave them whole and cover with cold water and a pinch of salt in a saucepan. Boil until a knife inserted in them passes through easily. Peel while still warm and mash or pass through a food mill. For the chestnuts, with a sharp knife, make an incision along one side of each chestnut. Place them in a pot and cover with cold water. Boil about 40 minutes (30 if they are small) or until tender. Drain and peel while still warm. Mash or puree/pass through a food mill for a smoother result. Combine the pumpkin, potatoes, chestnuts with the yolks, nutmeg and pinch of salt. In a separate bowl, combine the flour and breadcrumbs and fold it through the mixture until you have a soft but smooth dough. 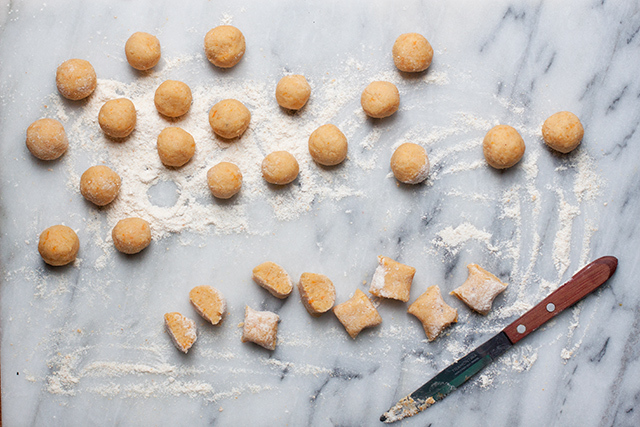 Take small spoonfuls of dough and, with floured hands, roll into balls. Or, on a well-floured surface, roll out sections of dough into a long long and cut into inch-long pieces, then roll these into balls. Prepare a burnt butter and sage sauce by melting the butter in a skillet with the sage leaves. Let the mixture infuse and keep cooking until the butter begins to brown to the colour of hazelnuts. Remove from the heat. 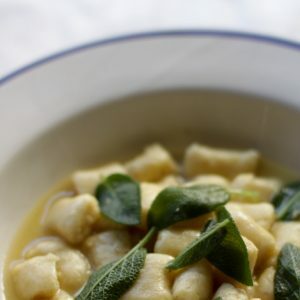 Cook the gnocchi in boiling salted water for a couple of minutes or until they float. Toss them through the butter and sage sauce, along with a ladel full of the cooking water and swirl the pan to create a creamy sauce. Serve immediately. I published this recipe recently for my column for Italian newspaper Corriere della Sera (which is nearly a year old!). 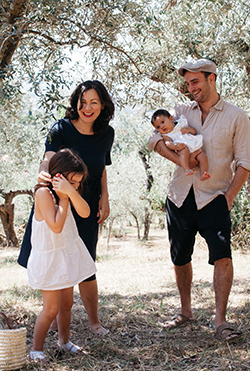 I don’t always share these recipes on my blog too but today a short, sweet video interview came out that I wanted to share, a collaboration with Corriere delle Sera as part of their series, Donne di Cibo, that is close to my heart — it was filmed at my home in Porto Ercole with my husband and my mini helper making fresh pasta for tortelli maremmani with me. Ah that Melbourne weather! I have only tried it with fresh chestnuts (which take up most of the prep time here), but with recipes I’ve seen made with the flour they do look ‘neater’ and smoother. Definitely worth a go! Thanks so much Paola. A lovely video and beautiful recipe. I love your video Emiko. Beautiful family you have! And your kitchen is so pretty. Thanks for this recipe. Must be delicious.,Would love to give it a try. Thanks very much. Unfortunately only renting but this kitchen gives me a lot of ideas for my own dream kitchen (one day!)! 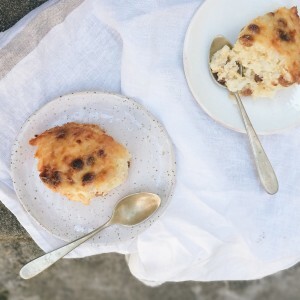 What a sweet video and a lovely recipe. 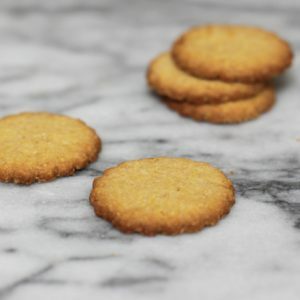 I really love these — you do need to have the time to make them, though the chestnut flour definitely helps cut down on the most fiddly bit if you’re in a pinch. They’re quite nice to do for guests or something special though, as they’re a bit different to the usual gnocchi. When it comes to pasta (or pizza, or anything that resembles play dough, the little one is thrilled!). and your family’s love of cooking really comes through in the video. ha! The kitchen is truly where our hearts are happiest! Hmm, I know what I’m buying at the market next week! Yum. And the video is sweet, even though I can only understand a smidge of Italian. Your cookbook hasn’t come out yet, has it? 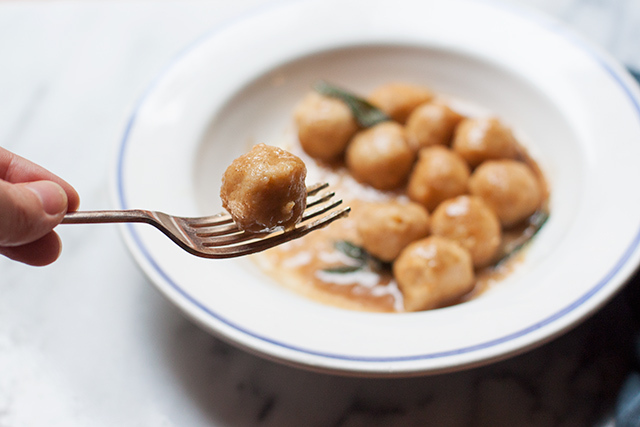 Pumpkin and chestnut gnocchi sounds so good! Loved the video – very helpful. Thanks Mary! 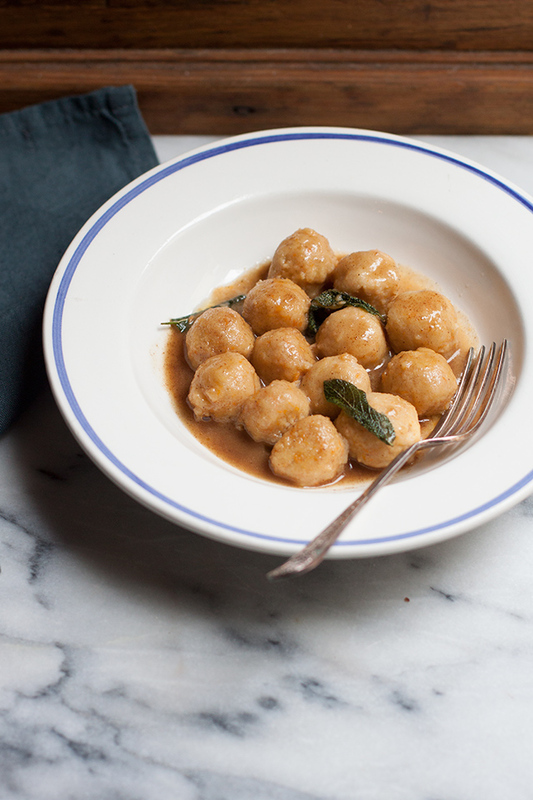 It’s a nice seasonal alternative to regular potato gnocchi. It is so nice to see you and your family and to recognize Porte Ercole on the video ! Wow…this is something innovative, It looks yummmyyy. And must say your daughter is very cute Keep sharing your video’s.